It had been awhile since I used Ancestry's "New Search" so since "Old Search" is going to disappear soon, I started to explore a bit. Over three million hits for phonetic variations of Cruvant? Really? This is what I expect from Soundex. Other surnames that share the same Soundex code as Cruvant include: Carpenter and Corbin. These surnames are not close to a phonetic match to Cruvant, but Soundex thinks they are. It was clear to me that whatever algorithm Ancestry was using for 'phonetic' was no better than Soundex. I started browsing through the screens to see when the non-matching names would start. 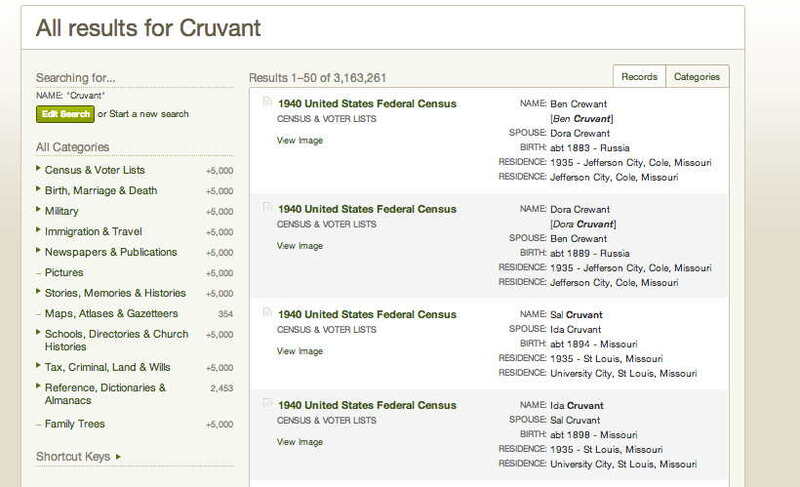 A little bit less than 300 matches for Cruvant, and over three million other surnames, none of which are likely the variations I would hope for: Kruvant, Kroovant, Cruvand, and Kruvand. There should be no reason the first two shouldn't come up with any algorithm coded for English phonetics. The latter two would be nice, but I would understand why they got missed. "There are other name matching algorithms that we can use to help identify records to consider for your results. If you choose phonetic we will identify appropriate algorithms that apply to specific data collections and if a record has one of those names, we will use it as a possible record for your results set. For example, if you are prioritizing Jewish Collections first, we would choose the Daitch-Mokotoff phonetic algorithm." In other words: We know of other algorithms. We aren't going to tell you what those algorithms are except for one we randomly choose for an example. There may be others. There may not be. We're not going to tell you. You can't select to use any of these algorithms instead of Soundex. If we decide an algorithm might be appropriate for a particular collection of records, we might use it. We might not. We probably won't even tell you when we do. Selecting 'Phonetic' is really the same as selecting 'Soundex' unless we decide it isn't going to be for a particular search, and we get to decide, you don't. But if selecting 'Phonetic' makes you feel good, go ahead. That's what we're here for, to convince you to click on checkboxes that 9 times out of 10 won't do anything. Note: I did conduct a Phonetic search on a collection of Jewish records, and a search on the surname "Kruvant" turned up no results when there were "Cruvant" records. See images below. According to this Daitch-Mokotoff converter they have matching codes. 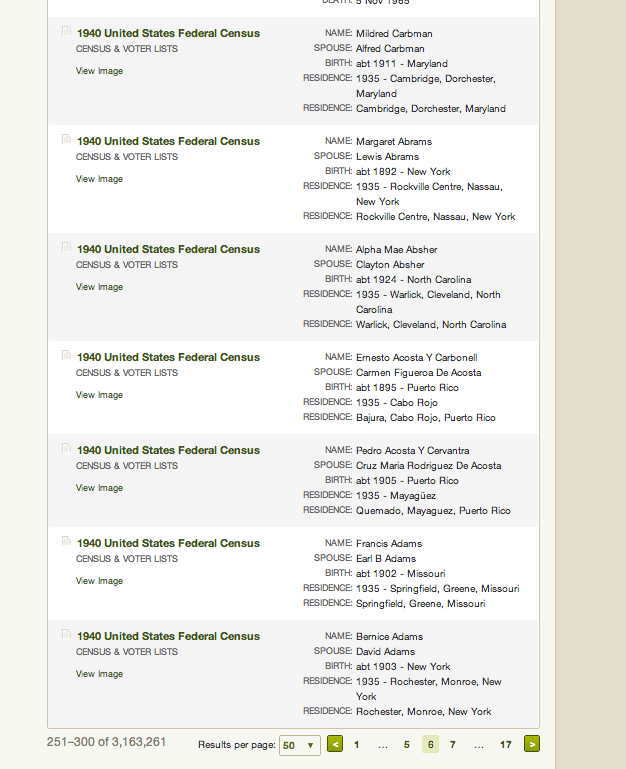 Which means Ancestry chose not to use this algorithm for that search. What a shame. The one algorithm they do mention, and a collection they imply they might use it for, and they didn't. I realize this has nothing to do with the difference between Old Search and New Search, since Old Search doesn't provide you with the 'phonetic' checkbox. I suspect someone might be able to point me to a collection where the Daitch-Mokotoff algorithm is used, but that's not the point. In the Jewish tradition, the Torah (aka “The Pentateuch” or “The Five Books of Moses”) is divided into weekly readings. The same passage is read every year at the same time on the Hebrew calendar. Each reading is referred to by the first unique Hebrew word in the passage. This week’s passage, Pinchas, covers Numbers 25:10-30:1, and there are two chapters with obvious genealogical tie-ins. I also feel one of these two chapters is doubly meaningful for this week. 2 "Take a census of the whole Israelite community from the age of twenty years up, by their ancestral houses, all Israelites able to bear arms." This is the second census taken in the Book of Numbers. The first was taken in Chapter One, at the start of the 40 years wandering in the desert. There were 603,550 enumerated. The count in Chapter 26 yields 601,730. A decrease. We are told only three individuals remain from the original census: Moses, Joshua, and Caleb. Naturally, we aren't given a complete transcription of either census (wouldn't that be wonderful? ), but a summary, with only a few individuals highlighted. We have to rely on the accuracy of the source for the total figures. Census records are of great use to genealogists, and where they don't exist, you will hear many complain. 1 The daughters of Zelophehad…came forward. The names of the daughters were Mahlah, Noah, Hoglah, Milcah, and Tirzah. 3 "Our father died in the wilderness… and he has left no sons. 7 "The plea of Zelophehad's daughters is just: you should give them a hereditary holding among their father's kinsmen; transfer their father's share to them. Probate and land records are also very useful for genealogists. However, perhaps the biggest take-away I get from this passage this week doesn't have anything to do with genealogy. Contrary to some opinion, the law isn't immutable. This biblical passage seems to be telling us: If you feel the law is treating you unfairly, take your case to the proper authorities (be it G-d or the Courts), and explain to them how you are being treated unfairly. If your cause is just (and the time is right) they will listen. The law can change. Of course, I mentioned back in March, that Politics and Religion can't be separated from genealogy. As they announced back in March the Google Reader app will be retired on July 1st. At the time I said I was going to try NetVibes and TheOldReader and choose the one I liked better. I chose TheOldReader very quickly. I was even very impressed when TheOldReader discovered where some old blogs had gone and moved to. I've seen an uptick the past few days in people asking for suggestions. Not too surprising. I'm usually in the group that waits to the last minute. Many people are recommending Feedly. However, Feedly still doesn't have a version for Internet Explorer. As I said back in March, I hate IE, but I am restricted to using it for a good portion of my time. I have also heard some complaints that Feedly doesn't have a 'search' function. TheOldReader does have a search function. On the other hand, TheOldReader doesn't have a mobile app. This isn't an issue for me, as I don't like reading blog entries on my iphone. I prefer the larger screen. Correction: TheOldReader has opened up their API and there is an iPhone/iPad mobile app that works with it. Feeddler. I will need to test it out, even though I think I will still prefer using a computer screen. While there are other options, depending upon your OS and Browser needs, TheOldReader and Feedly seem to be the favorites. For quite awhile Ancestry.com has been maintaining two separate search engines, one they called New Search, and the other Old Search. They announced yesterday that they are going to stop doing that. But unlike Coca Cola, they aren't retiring New Search. 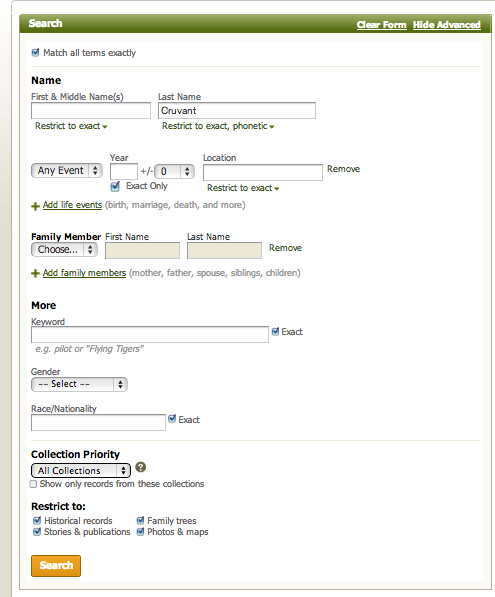 Ancestry.com is continuing our efforts to improve the search experience across Ancestry.com and will be making changes to our search functionality in the upcoming months. Some features will be added and some will be discontinued. As part of the 2% of our subscribers that use the old search function on the site, we know that you are passionate about the search experience on Ancestry.com and we are reaching out to you to get input on potential improvements. We hope you will take the opportunity to share your insights and feedback on our plans. As a former computer programmer, their explanation makes perfect sense, and I am surprised both search options lasted as long as they did. If they do combine New Search with the best 'features' of Old Search, I think many of the 2% will be happy. I find the layout of the search results in New Search less appealing, and more difficult to navigate. There are complaints that wildcard searches more often return error messages on New Search, and when they do work, yield less complete results than Old Search. As a former computer programmer I will state, working correctly isn't a 'feature' it's a 'requirement.' But if Old Search ceases to exist, there won't be a way for people to easily discover the results are incomplete. Reflections from the Fence: The 2 % Rant, NOT Feeling Special, And After All It Is ALL About ME! This week I share a transcription of a newspaper article I found at NewspaperArchive. No relatives are mentioned, but the setting is a neighborhood I've written about in the past, and in which several of my paternal ancestors lived at the turn of the 19th century. Finding out how the neighbors of my ancestors lived gives me an idea how my ancestors might have lived. Those who have read my earlier posts on the neighborhood know, it's not a pretty picture. Using my genealogy software, I first generated a lifespan report from six different family databases back in 2008 - Age is Relative, There is a lot of different data contained in the report, as can be seen in the original post, however for this post I am going to focus on average lifespan. Note: The numbers of individuals given are for the entire database, and includes those for whom both birth and death aren't known. The average lifespans are calculated on a smaller number of individuals. For each of the last four databases, the forebear is a 3rd great grandfather, so they are roughly equivalent in generation. I wondered at the causes of the apparent lower lifespans for my Denyer and Van Every lines. One possible cause included rural vs urban living. Another possible cause included sampling size. Did I just not have enough data? Perhaps, over time, as the database grew, the average lifespans for the different family branches would even out. In 2009, my database had grown, so I generated some updated statistics in Database Size and Lifespan Revisited for the full database, and for one family in particular. I discussed the dramatic drop in lifespan for the Kruvant family. It wasn't unsuspected, as I had just entered a large Register I had received from a cousin researcher including many Lithuanian cousins who 'died' in rather graphic ways between 1939-1942. Though one might point out that while the lifespan for that family dropped significantly, the result was pretty close to the full database. Was this really due entirely to the Holocaust, or did the simple growth of data play a role? I didn't consider this possibility back in 2009, but as my database has grown even more since then, I thought I would return to this topic, and I realized I needed to address it. The only way to do that was to generate a separate Kruvant database, run the statistics report, remove from that database every victim of the Holocaust, and then run the statistics report again. While I was just deleting records, and in a database I had generated only for this purpose, the process was a little disturbing, as I clicked on names, and the software asked if I was sure I wanted to delete the individuals. It appears the Holocaust accounted for almost all of the drop in the lifespan for Kruvant females, but it was only part of the equation for the males. Below are the current results for several other databases. The average male lifespan for the Denyer descendants has improved with added data, whereas the average female lifespan hasn't by much. The averages for my Van Every line have also improved, but only slightly. While the data so far is sparse, my mother's paternal Deutsch family appears to be among the longer-lived in my tree. I believe the low figures are due mostly to a very high infant mortality rate. For some perspective I looked at two more databases. First, I looked at my wife's database. I've only begun researching, and haven't entered all the data from a Register someone else produced. However, so far, it seems the women have a significantly higher lifespan than the men in her family. For another perspective, I looked at the Royal database provided with my genealogical software program, iFamily. The data goes back to the middle ages on some lines, so one would expect a lower average lifespan, which is the case. Regardless of the reasons, whether they may be based on geography, time, genetics, or something else, different families have different average lifespans. The women in my separate family databases seem to have longer lifespans, which is what I have been told is the case in general. However, in my full database, the gender difference is much less. This makes me wonder if there are some branches of my family where the stats are reversed. This week I look at a news clipping I found from the Missouri Republican, dated December 20, 1876, concerning a likely relative of my wife. Despite an absence of Amanuensis posts for awhile, I continue my project to transcribe family letters, journals, newspaper articles, audiotapes, and other historical artifacts. Not only do the documents contain genealogical information, the words breathe life into kin - some I never met - others I see a time in their life before I knew them. This week I look at a newspaper article found at ChroniclingAmerica, mentioning a possible relative of my wife's. Being able to identify the author of a document can be very helpful. It can be almost impossible to identify the author of a typed document, but a handwritten document is a different story. From the FBI Report: Mrs. Van Every then presented the family Bible with record of births that had been kept by her for many years, and this record shows that on January 15, 1886 a son was born and that his name is Samuel Opham Van Every, the record of this Bible has not been interfered with since the birth of this subject was recorded therein as it is in perfect condition and shows plainly that there has been no erasures of any nature. I have identified the handwriting on this document, as well as a date for when it was written. The handwriting above appears to be a perfect match to the document below, which my grandfather noted in 1965 was created by my grandmother circa 1940. Therefore it couldn't have been copied directly from the bible, but probably came from a combination of family knowledge, and research. For example, I am fairly certain that the dates for her grandfather's birth and death came from Rev. 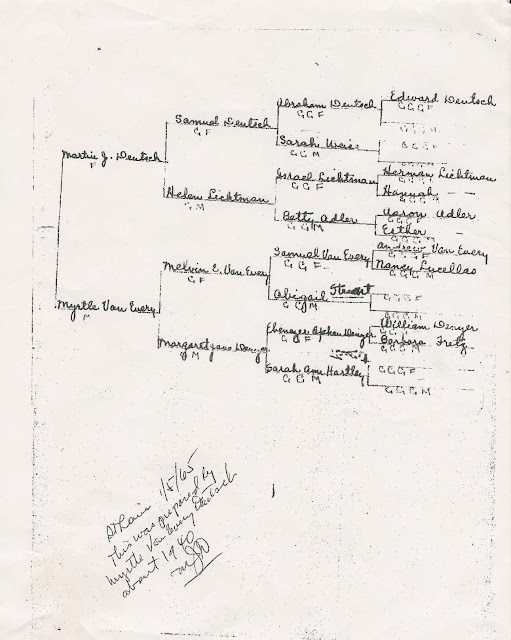 Abraham Fretz's genealogy on the Fretz Family. The Fretz genealogy is mentioned in some letters that her sister, Minnie, wrote. I am disappointed that no one in the family seemed to remember when Sarah Hartley Denyer Foster died (approx 1898 according to testimony provided to The Dawes Commission in 1900). Minnie was only 12 then, but it means no one recorded the date, or the records had been lost. Of course, in 1940, the only living individuals in that top chart were my grandmother, and her two sisters, Minnie and Evelyn. My great grandmother, Helen Lichtman Deutsch, lived until 1958. Samuel Deutsch lived until 1938. Knowing my grandmother drew my grandfather's chart circa 1940, when at least one of his parents was still around to answer questions, makes it more likely that the names for his ancestors are accurate. Samuel and Helen were the immigrants, and any records of their parents and grandparents currently lie undiscovered in Transylvania. I've blogged about my research on my Denyer ancestry before, but I thought I would create a summary post of what I have found so far. Information on which I am fairly certain ends with my third great grandparents, William Denyer and Elizabeth Sliver. My third great grandather, William, was the immigrant, and he married Elizabeth Sliver in America. Most of my information about the two of them comes from the work of Rev. Abraham J. Fretz, in A Brief History of John and Christian Fretz and a Complete Genealogical Family Register, 1890. 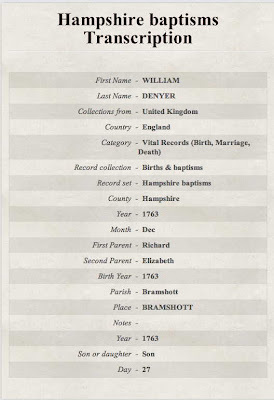 And the extent of the information provided about William was "He was born in the county of Southampton, Hampshire, England, November 22, 1794." Most of my research and 'conclusions' on prior generations could be critiqued as "Cinderella Genealogy" - a term I created for a common fallacy among some family historians. If the shoe fits, the fairy tale Prince's reasoning went, it must belong Cinderella. Because, clearly, no one else in the kingdom wore the exact same size shoe. However, keeping my mind open to other alternatives, these look like the best matches. Here's what I suspect is the marriage allegation for my fourth great grandparents, William and Jane Denyer. According to Fretz, my second great grandfather, Ebenezer Denyer, had a sister named Jane Goldfinch, so a connection to the Goldfinch surname is likely. Farlington and Portsea are also both located in Hampshire. Here are a list of baptisms from the Farlington Parish records. 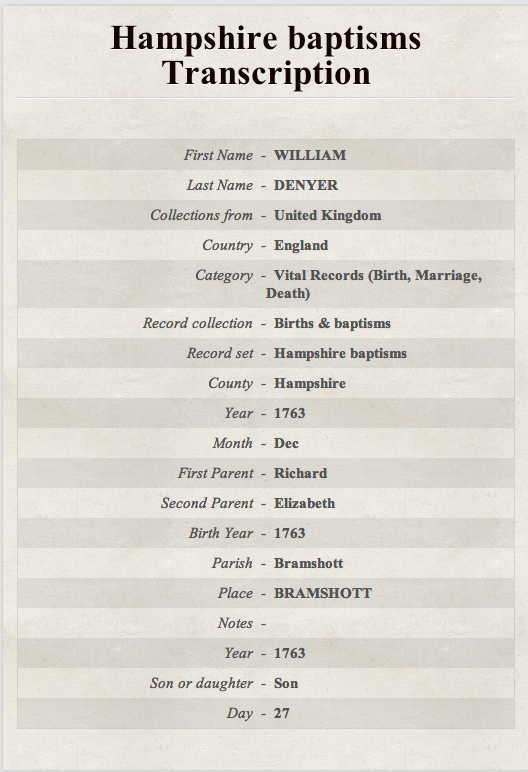 The parents for all of them, except Barnard Goldfinch Denyer, are listed as William and Jane. 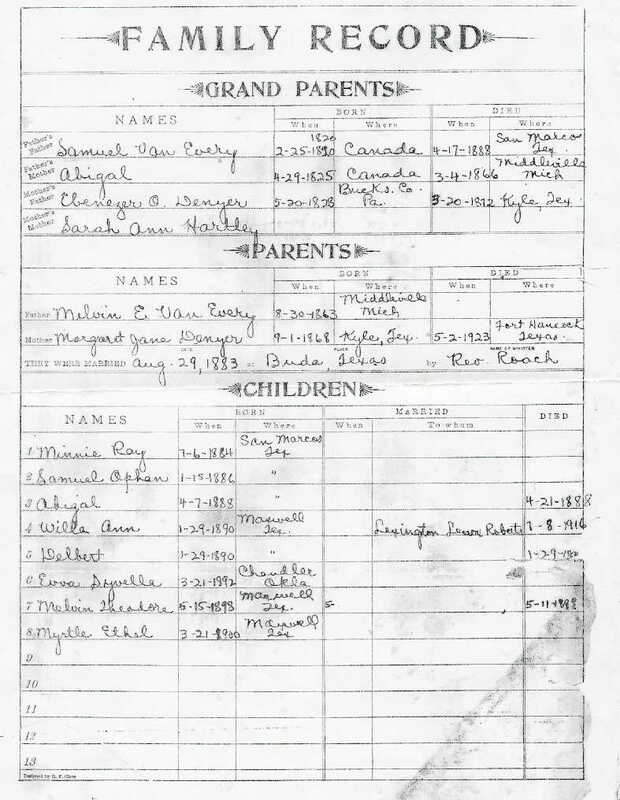 Barnard's parents are listed as William and Ann. I'm unsure if this is a clerical error or not. I suspect the William baptized in 1795 is my 3rd great grandfather, the immigrant. Baptisms several months after a birth aren't uncommon. FindMyPast indicates John Henry was baptized in 1796, which makes more sense, for if William and John Henry were twins, they likely would have been baptized together. All the public family trees on Ancestry.com that include William and Jane (Goldfinch) Denyer, include these children as theirs, so I am not alone in making this connection. Absent documentation that the William Denyer who married Elizabeth Sliver was born in Farlington, and not elsewhere in Hampshire, this is supposition. 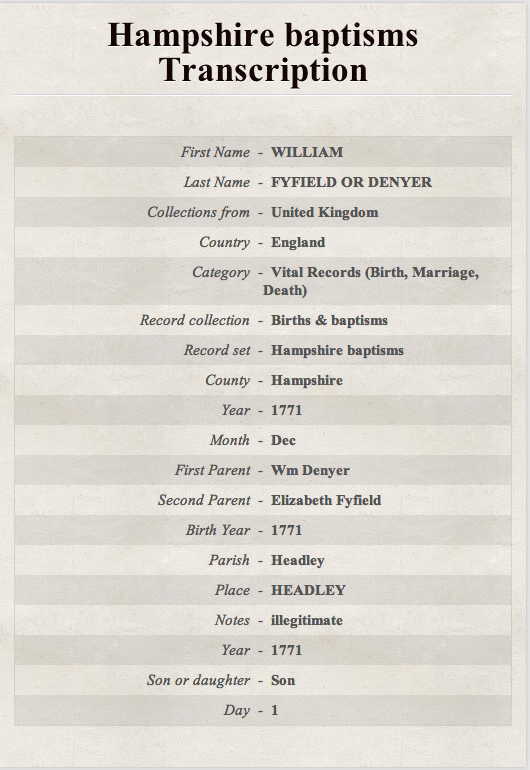 Here's a baptism record (from FindMyPast) for a William Denyer born in 1763, child of Richard and Elizabeth. 1763 is an unlikely birth year for the William Denyer who married Jane Goldfinch in 1791, as he was supposed to be 21 at the time of the marriage allegation. However, the text of the marriage allegation is a transcription. Someone born in 1763 could have been 27 in 1791, and a 27 could be mis-transcribed easily as a 21. Here's a 1771 baptism transcription for a William Denyer, illegitiamate son of a William Denyer and Elizabeth Fyfield. This is a more likely possibility, if the marriage allegation is correctly transcribed. The Farlington Parish burial records include three Denyers (Robert, Ann, and William - with William indicated as their son, and born in 1763) in April of 1807. 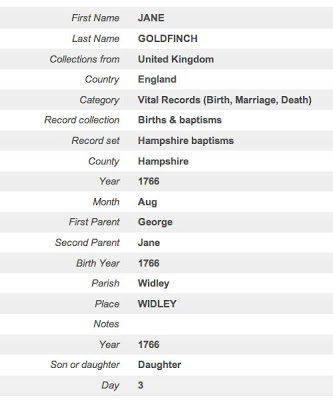 Most of the public family trees at Ancestry indicate this William as Jane Goldfinch's husband. I haven't found a 1763 baptism for a William, son of Robert and Ann. None of the public family trees cite such a source. 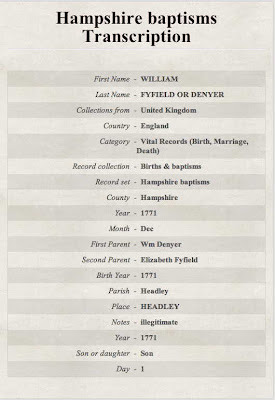 It's possible someone somewhere has found birth information for this William, perhaps from his death records, however, without any documentary evidence, I am uncertain this is the same William who married Jane Goldfinch. It is entirely reasonable to believe there may have been two William Denyers of similar age living in Farlington at the same time. It's a fairly common name. Here's a transcription of a 1766 baptism for a Jane Goldfinch, daughter of George and Jane. This is unlikely due to the year, since Jane was also supposed to be 21 in 1791, and neither 24 nor 25 are likely to be mis-transcribed as 21. Many online family trees identify Jane's parents as George and Jane, without any documentary evidence that it is the correct match. Goldfinch is another somewhat common surname. 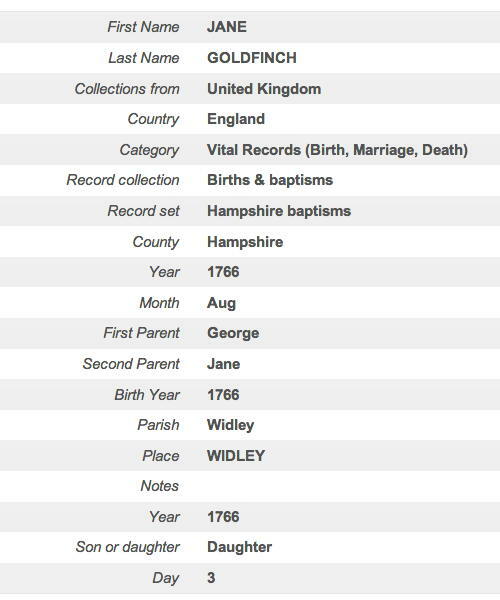 I haven't found a baptism closer to 1770 for a Jane Goldfinch. However, I have found a Barnard Goldfinch of Portsea, who died in 1789, and whose will indicated he had an unmarried daughter named Jane. The marriage allegation above indicated Jane was from Portsea, not Widley. One avenue of research I have considered is to try to research the history of ownership of the plot of land that is described in the will, and assigned to Jane. If I'm correct, it should have transferred from the Goldfinch to the Denyer family after William and Jane were married in 1791. Of course, it appears that William and Jane Goldfinch Denyer settled in Farlington, and not Portsea. So even if it was this Jane who inherited Barnard Goldfinch's land, it may not have been kept by her after the marriage. I have done a search for all the Denyers living in Portsea in the 1841 Census. There are a handful.